This post was originally published at Patheos.com in May 2014. But I thought it was worth republishing again here. Here in Western NY, the weather has finally warmed up and it looks like the s-n-o-w is gone until winter. That means it’s time for a reminder about leaving your dog in a hot car. In July 2011, I wrote a post for my blog in which I explained how heat affects your dog, and then did some experiments measuring the temperature in the car compared with the temperature outside the car. It’s worth reposting here, since it’s such an important issue – and because I think we have a moral responsibility to put our pets’ needs before our own desires. Sure, it’s fun to take the dog with you while you run errands. But it’s not always what’s best for Fido. As you watch the temperatures rise inside the Jeep in the following photos, remember that the heat affects your dogs the same way whether they’re inside a car or outside in the heat. So keep that in mind when you’re thinking about taking the dog for a walk in the heat, or with you when you jog, or even for just a round of catch in the park. And it doesn’t have to be summer; it’s the temperature that’s important, and it can reach dangerous levels even in the spring, fall or winter. First, let’s look at how a dog stays cool. In close quarters like a car (or even a kennel), a dog can overheat very, very quickly and in minutes can suffer brain damage or death. 2) As their weight rises to over forty-five pounds, dogs have increasing problems getting rid of heat. And that’s when the dog is at rest. 3) “Since dogs don’t have sweaty, bare skins to radiate heat [the way humans do when they sweat], evaporative cooling is not an option for them. Panting hard cools the lungs and brain, but the only place a dog sweats is through the pads of its feet. The pads just don’t have enough surface area to make them effective radiators.” Add to that the fact that their bodies are covered in fur, and you’ll understand why heat effects dogs much differently than humans. And you can see why it’s not easy for a human to determine how hot a dog really is. This post was originally published at Patheos.com in June 2011. I was sitting on the floor in the lobby of the veterinarian’s office, blowing soap bubbles for my five-year-old Border Collie, Scout, while we waited for our medications after our consultation with a holistic veterinarian. My dog Bailey was just outside, just hanging out in the grass, enjoying the evening air. She’d been outside maybe ten minutes when I went out to bring her in and saw that she had something pinned to the ground…it was a bird. I called to her, she moved towards me, and the bird jumped away. Bailey went after the bird, pinned it, and let it go. It hopped, she pinned it again. When it flew up about a foot, Bailey leaped up and caught it midair. And the race was on. I told her to drop the bird, trying not to freak out. The bird was alive, squeaking and flapping its wings. I threw Bailey’s favorite ball in the hope I could distract her long enough to throw the leash on her and get her away, but all she did was run around with the bird, periodically dropping it to yank out feathers and then grabbing it again and taking off, bird bones crunching audibly as she chewed on the run. My god, the poor bird! I tried to chase Bailey (bad idea). She’d drop the bird, I’d call cheerily and throw the ball again, and she’d start running. I used every attention-getting trick she’d trained with, to no avail, the bird getting smaller and smaller and me getting more and more panicked as the seconds ticked by. Could the bird even be saved now? There was no blood, just feathers flying. Maybe there was still a chance. Eventually I ran into the house, reached into the fridge, grabbed a handful of mashed potatoes, and ran outside to throw them to the dog. She came running gleefully, but only because she’d already eaten the bird. THE WHOLE BIRD. The head, the beak, the feet, and most of the feathers. I’d love to tell you what kind of bird it was, but the only thing she didn’t eat were a few feathers and the entrails, which oddly enough were left intact in the grass. The entire scenario, from the moment I spotted her with the live bird until the time she finally came to me? Maybe two minutes, max. Probably considerably less, although it felt like an eternity. I called the vet. We’ve just finished more than three weeks of dogs with stomach viruses and diarrhea and antibiotics, and I have no idea what’s going to happen to all of that bird that Bailey just ingested. The vet receptionist told me that dogs usually digest that kind of stuff really well, implying that this was a common thing, dogs eating entire birds. When I asked about the head, the beak, the feet, she simply said, “Yes.” When I pressed her – my dog ate a whole bird – she offered to have the vet call me to reassure me everything would be fine. Will it be fine? To say that I’m traumatized is an understatement. I watched a bird go from hopping and flapping one minute to feathers and entrails the next, its life taken before my eyes by the animal that I cherish. There wasn’t even any blood; just feathers and that little string of bird guts. My dog did that. I’m horrified that Bailey didn’t listen to me. She knows these commands cold and I tempted her with her favorite things. She should have listened to me. Then again, I had nothing to offer that could match a live bird. In her mouth. Of course, I shouldn’t be surprised. A few summers ago, she and Bandit made quick work of the three tiny baby bunnies that had been living in the back yard, bunnies who made the bad choice of hopping around right under the dogs’ noses and flaunting their frailty. It took me weeks to get over the fact that my dogs killed bunnies. Of course, I understand that this is real life, it’s nature, it’s animals doing what animals do. We have a hawk that often visits our yard; I’ve come outside to find more than one headless sparrow who couldn’t escape the clutches of a bigger, stronger predator. But at this moment, a few pin feathers still fluttering across the grass, this is too much nature for me. When I came inside after inspecting the yard for any body parts (there were none), Bailey was guzzling down a bowl of water and panting, her tail wagging, she clearly joyful for the hunt and capture she’d just executed. I looked her in the eye and, my voice shaking, whispered, “I can’t believe you just did that.” She stopped wagging and lowered her head a bit, and as our eyes met we both realized that, despite our mutual love and deep emotional connection, she will always be a dog and I a human. She will always eat birds and I will always be traumatized by it. I reached out to hug her. She nuzzled my neck. I stroked her head and cried. Bailey is sound asleep at my feet as I write, but I can hear her stomach gurgling, the bird likely making it’s way through her intestines. I’m praying she doesn’t throw up, at least not before darling husband gets home. The last thing I need now is a dog barfing up a bird’s head. 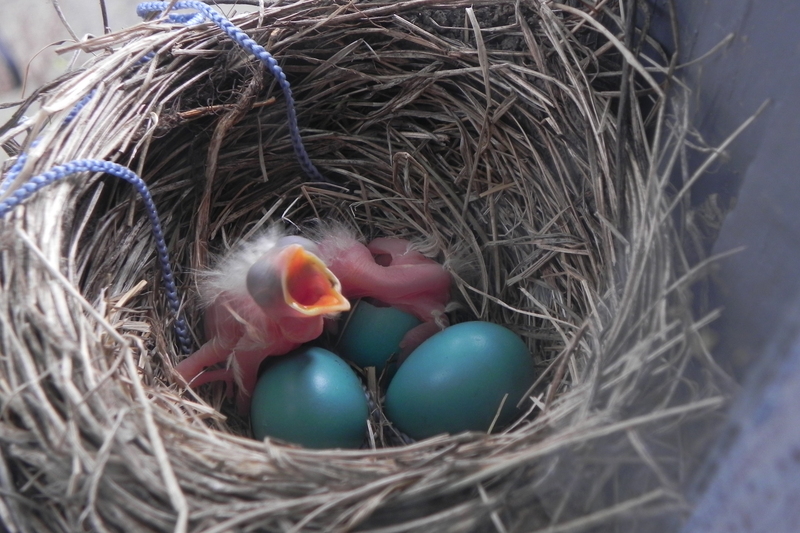 The first of Mrs. Robin’s eggs have hatched! But since today was so exciting I wanted to share the news here, too: two of the eggs have hatched! I found an eggshell in the grass this afternoon, a shell that hadn’t been there earlier in the day. So I snuck up into the garage attic to peek out the window at the nest. Mrs. Robin flew away just long enough for me to snap a couple of photos. One looks as if it had just emerged from the egg. I’m so glad we get to follow along with the miraculous birth of her babies! Stay tuned for more photos – Mrs. Morning Dove is also sitting on eggs!